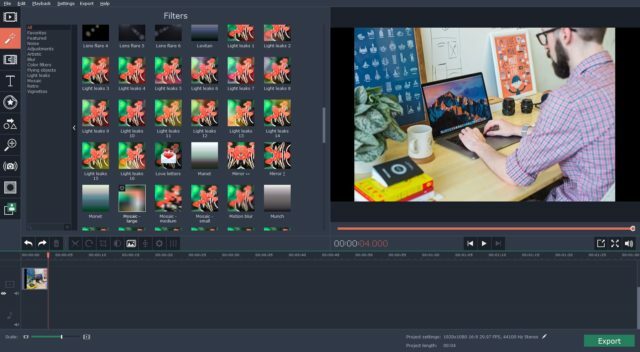 Considering most video editors tend to be cumbersome, difficult to use, and require a lot of experience – Movavi Video Editor is certainly a breath of fresh air. It serves up a powerful range of editing tools while at the same time adopting a user-friendly and intuitive approach, but to find out more you should look closer. Movavi Video Editor is a video editor that is designed to be easy to use. Rather than forcing users to go through a time-consuming and difficult learning curve, it focuses on making both its user interface and features simple and intuitive so they can be grasped quickly and without any hassle. The user interface of Movavi Video Editor is clean, modern-looking and easy to navigate. In has a ‘Timeline’ view that makes it easy to visualize the videos that are being edited, and a prominent ‘Preview’ window to see changes as you make them. All of the features that it provides are tidily organized into tabs or can be accessed via the row of icons right above the ‘Timeline’. Cut and join video segments to trim out unwanted parts or merge videos together in a specific sequence. Enhance the video quality and fix common faults and problems. Include additional audio tracks containing background music, voiceover narrations, or other sound effects. Apply various filters and effects to give the video a unique visual appearance and style. Add animated transitions to link segments together. Insert captions or other customizable text elements. Automatically create video montages using the smart ‘Montage Wizard’. In short Movavi Video Editor can be used as an MP4 joiner or to process video footage in other ways. Subsequently it will provide you with the tools you need to polish the video footage, make it look impressive, and give it a distinct visual style of its own. If you have ever wanted to be able to edit your videos, whether to improve them or create content of your own – Movavi Video Editor is an excellent option. Because it has such a user-friendly approach you won’t need any experience to get started, and can simply learn by experimenting with its features and familiarizing yourself with them. All in all Movavi Video Editor will let you quickly edit your video in any way you see fit. Its extensive features should cover all your needs, and ensure that you always have the right tools to get the job done. Ultimately having such an easy-to-use and powerful video editor is definitely going to be useful, in more ways than one. Did you Check Out Logitech’s Latest Washable Keyboards?